Demand for the GMC Sierra is up 14 percent this year to 90,000 units. DETROIT (Bloomberg) -- U.S. pickup sales are getting a boost from rising farm incomes, giving automakers extra momentum as the auto industry recovers from the worst sales in almost three decades. In the first nine months of the year, pickup sales rose 14 percent to 1.2 million, according to Autodata Corp., a Woodcliff Lake, N.J.-based researcher. The gain outpaced the 10 percent increase in overall industry deliveries. Grain prices have surged after droughts and flooding around the world ruined crops in such places as Russia and Canada. U.S. agricultural exports rose to $69.8 billion from $61 billion during the first eight months of 2010, according U.S. Department of Agriculture data. That rising trade contributed to a projected 24 percent gain in new farm income in 2010, the USDA said in August. “It makes intuitive sense that if the agricultural industry is rebounding that pickups would come along for the ride,” said Joe Barker, an industry analyst with IHS Automotive. Light-vehicle sales fell to 10.4 million cars and trucks last year, the lowest annual total since 1982. That idea drew executives from Ford, Chrysler, General Motors Co. and others to the annual Texas Truck Rodeo in San Antonio, held by the Texas Auto Writers Association this weekend. The automakers are competing for the Truck of Texas award and others that often show up in regional marketing campaigns. “Texas is the biggest market for the vehicles that they make the most money on,” said Michael Herzing, president of the Texas journalist group. Sales of Ford's F-Series pickups rose 31 percent to 386,000 during the first three quarters compared with last year, according to Autodata. 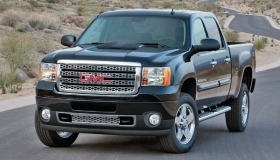 Deliveries of GM's Chevrolet Silverado increased 17 percent to 267,000 and its GMC Sierra rose 14 percent to 90,000. Meanwhile, Chrysler's Ram pickup sales slipped 1.6 percent to 140,900 during the period, according to Autodata. Sales by Asian competitors rose as well: Toyota Motor Corp.'s Tundra sales rose 21 percent to 69,000 and Nissan Motor Co.'s Titan deliveries increased 27 percent to 17,500. The Texas share of large pickup sales to individual customers -- excluding governments and companies that buy large numbers of vehicles -- has risen this year compared to last year. Texas customers made up 17.2 percent of the large pickup market, up from 16.7 percent last year, according to Edmunds.com, a Santa Monica, Calif.-based researcher. Texas's 247,500 farms made up 14 percent of the nation's total farmland, Edmunds said, citing data from the U.S. Department of Agriculture. The market share of large pickup has risen to 11.4 percent from 10.9 percent last year, Edmunds said, and the average sales price was $34,235, an increase of about $2,000. Automakers typically make more money off the sale of pickups than cars, Barker, the industry analyst, said, noting estimates as high as $15,000 for each truck sold. Construction outside the housing sector is also helping move pickups, he said. While pickup sales have improved, they aren't close to what they were just a few years ago. Large truck sales in 2002 were 2.2 million, according to Edmunds.com. “The large truck market is rebounding from last year's low, but we may not ever see large truck market share return to its 15-plus percent high in 2005,” Ivan Drury, an Edmunds analyst, told Bloomberg in a statement.